Once again Woody Allen has proven that that one’s personal life can be screwed up or what not while one exhibits brilliant creativity. 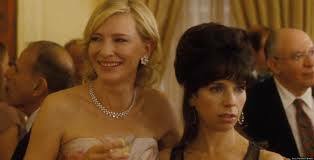 In Blue Jasmine he has written and directed a film that is deeply complex and both current and timeless. The film should go down as one of his best works. 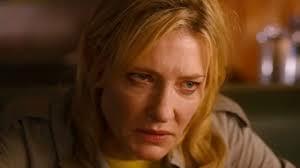 Cate Blanchett stars as Jasmine, formerly married to Hal (Alec Baldwin) – think Maddoff, who was imprisoned for investment fraud (never quite explained) and then killed himself in prison. She has supposedly lost everything. Distraught would be an understated description of her mood. We first see her on her way from New York to San Francisco (flying first class) where she intends to find refuge with her sister Ginger (Sally Hawkins). We examine her character via flashback memories seamlessly juxtaposed with current events. Jasmine is a woman with little going for her. She is high-strung, short-tempered, self-absorbed, snobbish, shallow and judgmental. She is also gorgeous and well-dressed, having managed to snag a rich husband early on, a single feat that bestowed upon her all the rights and privileges of upper-upper class life in New York, a world of pampered socialite women. Having mostly ignored her sister and been scathingly condescending when she had to see her, self-named Jasmine (formerly Jeannette) is now at Ginger’s doorstep. Much is made by her that she and Ginger were both adopted, but they agree that they had happy childhoods when growing up together. Ginger is perhaps the direct opposite of Jasmine. Divorced with two kids, she works in a grocery store two doors down from her walk-up apartment. Ginger is sincere, warm-hearted, outgoing, optimistic and fun-loving, as well as a little high-strung and insecure. But she loves her sister. She would like to have more money and live “better,” but goes with the punches. One “punch” was Hal’s swindling her and her ex-husband Augie (Andrew Dice Clay) out of a bundle of money. Unlike her ex, Ginger is the kind of person who lets that sort of thing go because she and Jasmine are family and anyway doesn’t seem like the kind of person who dwells on those things. Her adoring boyfriend Chili (Bobby Cannavale) was about to move in before Jasmine announced her plans to come and stay for a while. Allen is known for featuring the setting (Paris, New York) as if it were one of the characters. In this film we see quite plainly the contrast between Jasmine’s former New York surroundings and Ginger’s neighborhood, including the inside of her employer’s store. The contrasting images are priceless albeit not always as grand as in previous movies. The sets and streets do indeed help to tell the story in ways that less talented filmmakers sometimes fudge, forgetting that everything counts. Allen is spot on in examining the women’s circumstances and the choices they make. A shell of a person, Jasmine was taken up by a world that tells women that the best life is one of wealth and comfort and a certain “style” that can only come from a particular kind of man and certainly not from within oneself. I was prepared to be completely unsympathetic toward Jasmine, and indeed she is an unlikeable character. And yet she is a product of a gendered society, an example of “learned helplessness,” a woman unprepared to handle the life she is given, nor much of any other life for that matter. Yet she is an adult and has choices, not to mention a grown son. Casting about to figure out how she can make a living and dissatisfied with her new clerical job and computer classes, Jasmine jumps at the potential opportunity to give up all that striving to become a kind of mature trophy wife to an up and coming politician (a wonderful Peter Sarsgaard). She makes some choices and as a consequence past actions come back to haunt her. The audience is somehow asked to make judgments on all of her choices and frankly it isn’t easy. Some of her (and Ginger’s) dilemmas become our dilemmas. (Allen does this well.) Would I have done the same thing, knowing the costs? I don’t know. Ginger makes bad choices too but has survival mechanisms bolstered by a grounding in reality that perhaps Jasmine has never had. Underlying all is the issue of greed, greed that subsumes human relations, generosity and fairness. How much is enough and to what is one entitled? To Ginger and Chili a slice of pizza or bowl of clams seems pretty much enough while to Jasmine and Hall there is never enough, insatiability is all. Like the gendered culture, the culture of greed is also a driving force. Allen manages to avoid class stereotypes even as he contrasts the lives of the elite with those of the working class. All of the characters are real, recognizable, human and smart. Not one is a caricature, with the possible exception of Hal. 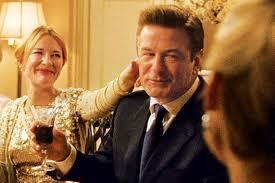 Alec Baldwin does a great job of playing a cad, not only dishonest but philandering as well. Are they all alike or does it just seem that way? In any case, the casting as well as the writing are brilliant and include a brief appearance from Louis CK. All of the performances work together as a whole. Allen is gifted at bringing together an ensemble and he’s done it again. For me the best movies are ones that linger, with story lines popping up days later in one’s mind, suggesting questions about the characters’ lives and in the end our lives. This movie is among them.